Home › My activities › Contributing to CS community..starting with Dzone! When I took the decision to follow my passion and to choose the career that fits me better, I’ve started a journey that is different, a journey which requires a lot of effort in order to stand from the crowd. Along the way, as I like to be involved in a community, to support and be supported, I’ve been thinking about launching a lot of initiatives. However, there was one constraint: each of these ideas that came to my mind required much time, which I couldn’t ensure at that time as I had a full plan with other priorities. One day, I told myself why not sharing the knowledge I gain while I’m learning? As I read a lot of articles, if I summarize the best links about learning something and the best way to learn it in one article, I would make it easier to others to find what they need without having to spend much time searching on the internet. So, I read different suggestions about how to write a good article (A common habit before doing something, I look for tips and pieces of advice on how to do it in the best way) and chose to write about a subject that is classical in computer science but that I saw differently! I was fascinated when learning it because I was discovering not only how powerful is the human brain but also how this thing is making a huge impact in our lives! The selected subject was: Algorithms. Writing the article was a difficult phase, I struggled to formulate what I want to say. It took me many days and still, I was not satisfied with the quality of what I wrote. I didn’t publish it. Then, I remembered a sentence that one of my friends told me about that situation: “Don’t let perfection be the enemy of good.” It was like an awake! So, I made the step and published it on my website! To my big surprise, the article was successful! I found even some of top data science influencers sharing it and encouraging me! The success of this small imperfect action pushed me to try something new. I had a desire to contribute to a bigger community in order to reach a bigger audience and so help more people! As every accomplishment starts with the decision to try, here is the result! I submitted my article in Dzone, a CS community that I admire too much, And I got accepted! 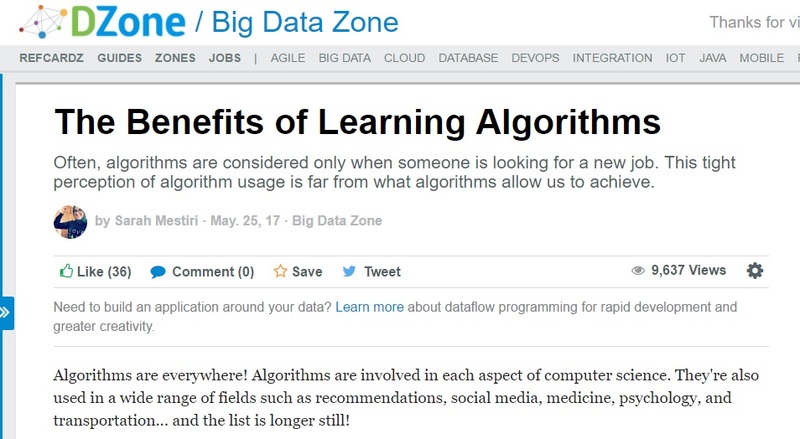 My article The benefits of learning algorithms was there! I enjoyed how they put it in “Big Data Zone”!! Today, after one month from making it available through Dzone, I’m happy to know that more than 9000 people viewed it and I hope that the content supported and motivated them! It’s just such a rewarding experience! Stay tuned! I’m preparing a new contribution for the coming week! Thank you for sharing your experience Keep up the good work i love your blog !